Saguache Town Hall is located at 504 San Juan Avenue. It is open daily (Monday through Friday) 8:00 a.m. to 4:30 p.m. 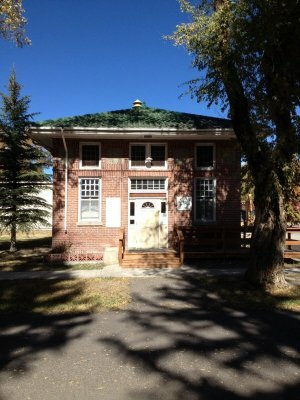 The Town of Saguache has Otto Mears Park and the adjoining Saguache Community Building. The Park is open to general use, and also available for special events. The Community Building can be rented for events. The Pavilion in Otto Mears Park is also available for use by groups. Visit or call the Town Hall for information. The Public Works Department is housed in the garage/shop behind the Town Hall. The Town owns and maintains two wells and a water tank, as well as water and wastewater treatment facilities. The Old Dump is available to residents at scheduled times for limbs and yard cuttings only. Floyd Smith Park is a half block east of the Town Hall. The Dave Martinez Park is a pocket park downtown on 4th Street.